Jon and I both choke on our food as Barry Blanchard walks to our table at the Summit Cafe in Canmore. Clearly we are not part of said gallery, but Josh Smith, Jim Elzinga and John Freeman are. We spend the next few minutes gawking as Bubba talks with Josh & the rest of the crew at our table. After Barry asks Josh what we are up to today, he replies: “We were thinking of doing something on Yam, but I’m in for something less committing, so we’re thinking of heading to Echo Canyon”. While we had intended to climb on Yamnuska as two parties of two, Echo Canyon became the plan. I felt relieved and disappointed at the same time; it would have been awesome to try Dreambed with Jon (our intended plan), but long routes can be intimidating and stressful. Instead we enjoyed a casual day at Echo Canyon, pulling on steep sport routes. Dreambed would have to wait till another time. Josh Smith on a route at Echo Canyon. I scramble down and after emptying our bags, throwing guidebooks and helmets down the talus and trying all sorts of other things, the cams fail to appear. We swear at each other, the wall and the meager set of cams in our possession but nothing resolves the situation. Not a chance we are trying the route without the cams. After getting back to the car we find the bigger gear in a milk-crate in the car. We remember thinking how awkward the big set of cams was going to be in the pack. We’ve been joking about leaving gear behind ever since if it looks awkward to pack. Out of the corner of my eye I see a small cloud of dust & flailing limbs, four body lengths up. Cole doesn’t even have time to yell “Rock” before the block already passes the belay and smashes leaf and limb off the trees at the base.. Luckily the belay at the top of the first pitch is ~3m to the right of the first 3 bolts, otherwise I would have been directly in the line of fire. The toaster-sized block failed as Cole was pushing down on it, missing him completely. Miraculously, Cole manages to hang on and continues to climb. He sends the crux pitch in good style, making a delicate traverse on crimps to easy ground and the belay. The next pitches pass in a blur, with much engaging climbing. A steep, awkward sport pitch followed by a long, beautiful pitch (45m) with bolts and a gear-protected layback crux. The good cam placements inspire me to pull just a little harder and send the traditional crux of the route. The second-to-last 5.10c pitch has an incredible flow to it. Cole did an excellent job of climbing the steep slab over small cams on bomber rock. The last pitch climbs the first few moves of Red Shirt’s last pitch and then continues straight up to a short steep corner. A worthwhile pitch that can be a fun variation to Red Shirt’s last pitch! We top out with time to spare. The route more then fulfilled our desires to climb a steep route up Yam and we hiked back happy and relieved. For the most current guidebook information, please see Andy Genereux’s excellent Yamnuska Rock (Rocky Mountain Books, 2006). Any updates to the guidebook can be found on the TABVAR website. There is a rumored updated edition coming out soon. Many routes have been climbed since the last update, easily making Yamnuska the most developed multi-pitch wall in the Canadian Rockies. From the Yamnuska Parking lot, follow the hiking trail (heading west) out of the parking lot. As you cross the quarry road, there’s a sign-in book for climbers (recommended). Follow the hiking trail steeply to the top of Yamnuska Bluffs a small sandstone cliff that is being quarried on its western end. Follow the trail straight ahead (climbing icon) and continue to the base of Yamnuska. The trail meets the cliff around Kahl Wall. Continue east along the base trail, staying close to the base of the wall to a good looking right-facing corner, the first pitch. Tim Mooney, Rich Akitt and S. Morrison established this route in July 1994 to provide a hard, reasonably protected route up the South face of Mt. Yamnuska. This style was different from the previous generation of routes. 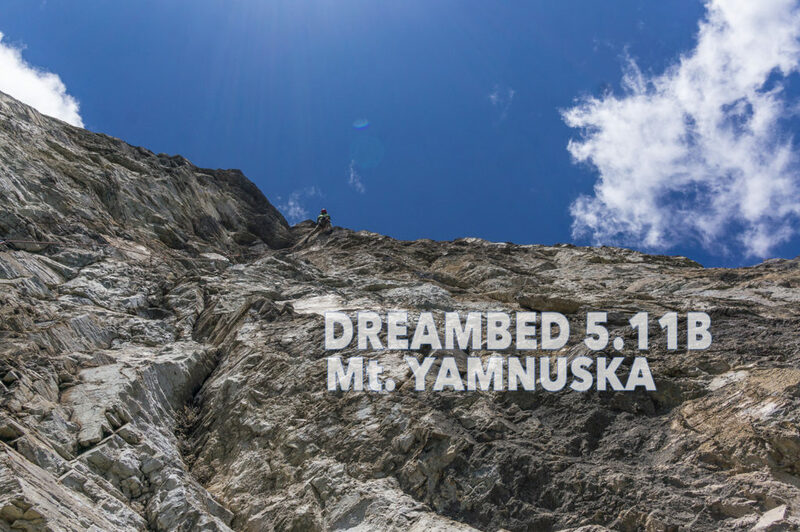 While most technically difficult routes of the previous decade were run-out, Dreambed became one of the first modern mixed traditional style climbs. The first ascentionists put in 10 difficult days worth of ground-up effort, hand-drilling all protection bolts on lead. Despite being similarly graded as CMC Wall, the route is considerably safer on mostly exceptional rock (by Rockies standards). Although there are extensive bolt-protected sections, there is (well-protected) traditional climbing up to 5.10+. These factors make it one of the more popular “hard” routes on the wall and an excellent introduction to 5.11 limestone in the Canadian Rockies. As can be seen in the above trip report, even on well-traveled routes there’s serious rockfall hazard, so a helmet is considered a very good idea or even mandatory. A standard rack of nuts, a single set of cams (including micro-cams) to #4 and 16 (alpine) draws cover all the pitches. We found a selection of quick-draws nice for the crux second pitch (a few gear placements). Unless combining pitches, a single rope is an excellent choice. Packing a second, thinner rope for possible retreat can be considered as well. The route was bolted in such a way that you can leave the piton hammer at home. Cole following the amazing first pitch, one of the best limestone crack pitches I’ve climbed to date (5.9/5.10a). The crux 2nd pitch, climbing the delicate crux traverse. Following the crux gear pitch, a super fun and varied 45m pitch, with a steep sport section and a 5.10d layback crux. It puts you at the 5th belay of Red Shirt.